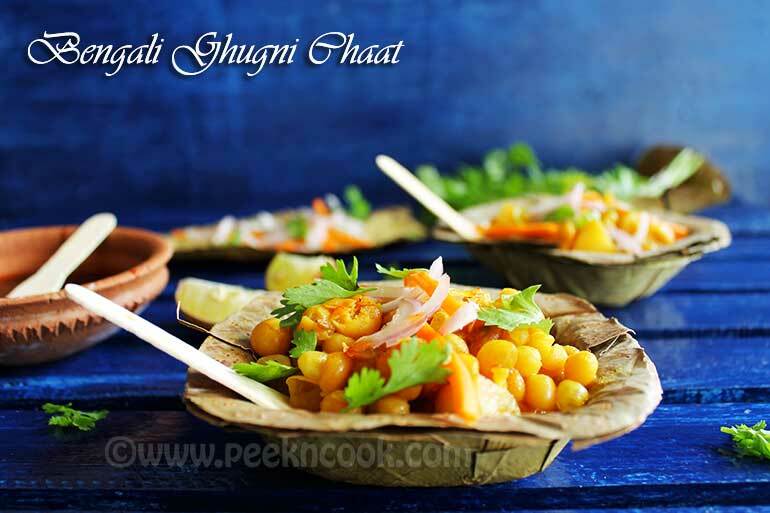 One of the famous street food is "Ghugni Chaat". Ghugni is made with Dried Yellow Peas. At first we have to soak the Dried Peas for overnight, and then boil it first and cook with spices. At first take the overnight soaked "Dried Peas" in a pressure cooker with little water in it, add salt and pressure cook on medium heat upto 2 whistles. Turn off the heat and place the cooker under running cold water. Open the cooker lid and keep aside. Take a pan, heat the oil in it. When the oil s hot enough, add bay leaf and cumin seeds and fry for 30 seconds. Now add the chopped onion to the pan and some salt, fry till the onion becomes soft & light brown. In the meantime make a paste of turmeric, cumin, red chili powder with 2 tablespoons of water. Now add the ginger & garlic aste to the pan. Sprinkle some water to the pan to prevent the onion from burning. Fry for few seconds. Now add the spice mixture which we made earlier. Fry for few seconds till oil oozes from the mixture. Add the chopped tomatoes, sprinkle some water and cover the pan with lid. Lower the heat to cook the tomatoes and remove the raw flavor of it. It will take 2 minutes. After 2 minutes open the lid and stir fry the masala for 1 minute. Now add the fried potatoes & boiled Dried Peas and toss with the masala mixture. Add 1/2 cup of warm water to the pan and let the curry boil for 5 minutes, covered on low heat. After 5 minutes of boiling sprinkle some garam masala powder on the curry and give a nice stir. Turn off the heat and let the curry stand for 10 minutes. Your "Ghugni" is ready. Now its time to make the chaat. Take one bowl of Hot Ghugni", add 2-3 tablespoons of Sweet Tamarind Chutney, Chopped Onion, Cucumber, Cilantro, Black Salt on the top, add Lemon Juice and enjoy Spicy Tangy "Ghugni Chaat".